O craft, all ye faithful. Athens Church of Craft will have a long overdue meeting on Saturday, April 14 from 3-6pm at X Ray Café. X Ray is located at 261 West Washington Street in Athens. 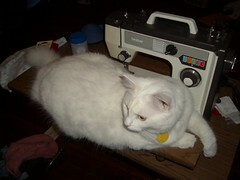 As usual, please bring your latest craft project to work on. If you would like, bring a snack to share. The Church of Craft, Athens, Georgia, is one of many Church of Crafts located around the world. The Church of Craft Athens was started by Missy Kulik and Raoul de la Cruz in March 2006.